Heat 1 tbsp oil in a frying pan. Season and dust the chicken with flour, brown on all sides. Remove. Fry the pancetta and mushrooms until softened, then remove. Add the final tbsp oil and cook shallots for 5 mins. Add the stock and vinegar, bubble for 1-2 mins. 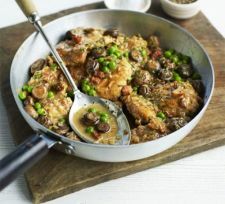 Return the chicken, pancetta and mushrooms and cook for 15 mins. Add the peas and parsley and cook for 2 mins more, then serve.